Place the ranch dressing in the lid container, or at the bottom of a regular mason jar. Place 2 cups of lettuce in the bottom. Then layer with the jack cheese. Place the red bell pepper hearts (using your clean fingers or long tweezers) along the side of the jar, using the cheese to hold it in place. Next, layer with the salami strips and green onions. 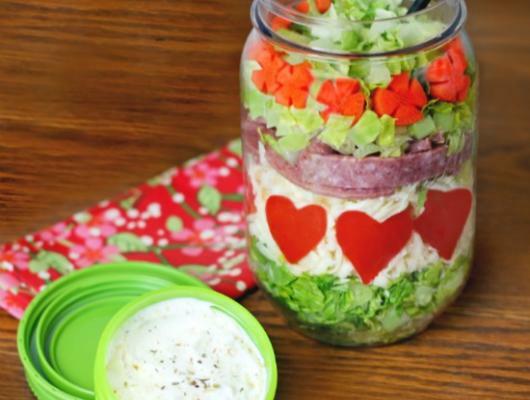 Then layer the rest of the lettuce on the top and place the carrot flowers around the side of the jar. Screw on the lid and store in the refrigerator until ready to eat. 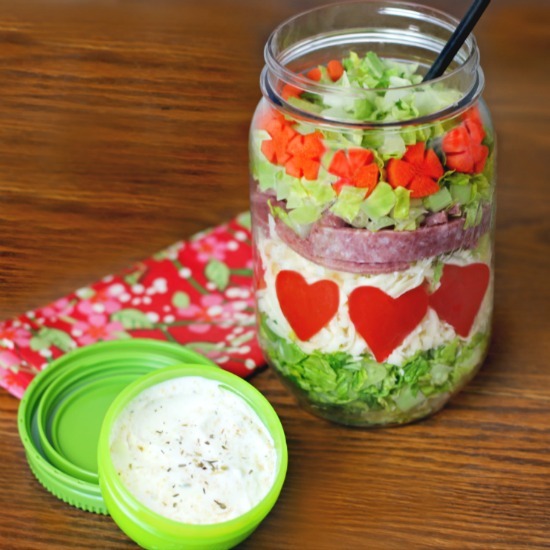 Salad in a Jar with Pepper Hearts and Carrot Flowers are a Fun & Tasty “grab and go” Lunch idea that’s full of healthy ingredients.